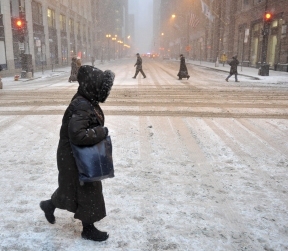 Governor Pat Quinn recently made a statement urging the importance of residence to use one of Illinois’ 100 available warming centers as temperatures reach extremely cold temperatures during this winter season. The warming centers are located at various Illinois Department of Human Services (IDHS) offices throughout the state. IDHS warming centers are open to the public during regular business hours, Monday through Friday from 8:30 a.m. to 5 p.m. In addition to the IDHS warming centers, the Illinois Tollway Oases in the Chicago area are available 24 hours a day, seven days a week. Governor Quinn and the Illinois Department on Aging are also encouraging relatives and friends to make daily visits or calls to senior citizens living alone. Seniors are more likely to get ill from the cold weather, so these elderly residents should set thermostats above 65 degrees in their homes. Seniors who keep thermostat temperatures low in order to reduce heating bills risk hypothermia. • Dress in layers, both indoors and outdoors. Keep active. Make a list of exercises and activities to do indoors when you can’t get out. • Eat well and drink 10 glasses of water daily; Stock up on non-perishable food supplies, just in case. • Keep extra medications in the house. If this is not possible, make arrangements to have someone pick up and deliver your medications. • Do not shovel snow or walk in deep snow. Plan now for someone else to shovel the snow. The strain from the cold and hard labor could cause a heart attacks and sweating can lead to a chill and even hypothermia. To find a warming center near you, call the IDHS hotline at (800) 843-6154 or visit www.keepwarm.illinois.gov.